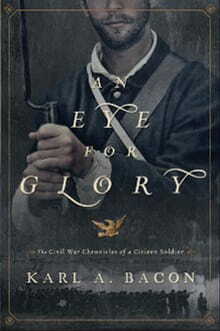 EDITOR’S NOTE: The following is an excerpt from An Eye for Glory: The Civil War Chronicles of a Citizen Soldier by Karl Bacon (Zondervan). General Reno’s corpse was the first I saw during the war. As the hour approached midnight on Sunday, September14th, 1862, the thoroughly winded green recruits, amongwhich I was proud to be numbered, crested South Mountain atTurner’s Gap. The march from Frederick, Maryland, had beenlong and hot, with few breaks for coffee and rations. When, duringthe course of the afternoon, the men heard the din of fightingerupt, and when they saw battle smoke enshroud the long ridgeahead of them, each untested man looked about at his mates. Hesaw jaws clenched, faces drawn, skin pallid, and eyes wide withfear and uncertainty, countenances that mirrored his own. With nightfall the battle clamor ebbed, then stopped altogether as the men toiled up the mountain toward the gap. All were eager to end the day with a hot cup of coffee and a peaceful night’s sleep. An ambulance was parked in the grass next to the road. A mule hitched to the front of it stamped nervously as we passed. At the rear of the ambulance a single torch of pitch blazed and alone soldier stood guard, head low to his chest, stoop-shouldered. He stirred at our approach, raising his head slowly, as if with great effort. “Fourteenth Connecticut Volunteer Infantry of French’s Division,” someone answered. The sentinel stood with his back to the torchlight, his black slouch hat pulled low, casting his visage deeply in the shadow of the half moon. He appeared a faceless phantom, breathing and moving as one of the living, but when he spoke, his voice was hollow and lifeless. “Did you hear about General Reno?” He waved at the ambulance behind him. “Major General Jesse Lee Reno — a great patriot, a soldier’s soldier, a true fighting man, not like some of these other dandies we have. We loved him like a father.” The man spat at the ground. “Now he’s dead.” The man shook an upraised fist at the darkness to the south. “My general. He’s dead and I wouldn’t believe it unless I’d seen it myself. We’d already whipped those devils, but they just shot him down as they turned to run.” The man lowered his head to his chest again, his voice a murmur. Still none of us had any words for him. Our feet began to shuffle forward, leaving the sentinel to resume his mournful vigil. A few minutes later we came upon a large field. Gasps of horror arose from the column as spectral shadows flitted from place to place about the starlit meadow. But as our eyes adjusted, the shadowy figures turned out to be some of our own troops. There had been a great and bloody fight upon that mountain and our boys had won it, but there had been many casualties, both Union and Confederate. Burial details worked by torchlight on both sides of the road, moving from one black heap to another, checking for any signs of life before tagging the body for interment. The bodies of our Federal comrades would be the first to be retrieved. If time and will allowed it, the enemy dead would also be buried, albeit in cursory fashion. Otherwise, their corpses would be left to the elements and their rotting flesh would see yet another battle, this time between the birds of the air or the beasts of the field over which would carry off the choicest parts. The regiment was ordered off the road to camp for the night in this field of death. We moved slowly among the corpses, carefully trying not to stumble over them in the darkness or tread on any flailed appendage. Some of the men were fortunate to find enough room to spread out their rubber blankets and build campfires, but for most, the stiffening, bloating corpses of the enemy dead had to be moved aside and even stacked one upon the other to clear sufficient space. It was the first time I had seen dead bodies like that. I had been to several memorial services in our church, but the body of the deceased was always someone known to us, possibly a loved one, and the body was always laid out carefully in a simple coffin, making it easy for the viewer to imagine the person asleep rather than dead. But in that field, the pale moonlight revealed the bodies of those pitiable soldiers to be grotesquely contorted in every imaginable way, a terrible testament to the agonies suffered in the last moments of their struggles with death. “No, I never . . . I thought . . . I don’t know what I thought it would be like. War means killing, but this is so . . . terrible.” John and I roamed the field in search of an unspoiled place. Perhaps the worst was the smell of the freshly dead. The sickly sweet odor of blood spilled upon the ground and the more powerful stench of bodies blown apart with their entrails cast to the four winds combined in a reeking aroma that, perhaps even more than sight, spoke sickening volumes of the gore all around. As I lay on my blanket, I could look only upward at the heavenly host above me, or I could close my eyes tightly shut against the hideous specter of those bodies, but I could not shut out the smell. I turned over, face downward to the earth, and tried to will myself to sleep. I buried my face in the crook of my elbow, hoping the odors of earth and grass and India rubber would crowd out the sickening odor of death. At last, I remembered the words of the psalmist and repeated them over and over until they grew into a drumbeat for my troubled heart, Thou shalt notbe afraid for the terror by night . . . Thou shalt not be afraid for the terrorby night . . . Thou shalt not be afraid for the terror by night. . .